The weather’s warming up as we head into what should be a glorious spring weekend here in eastern Ontario. I spent an hour and a half this afternoon out working in the garden, raking back all the woody debris to give the tulips and irises and other early risers some breathing room, and then followed that up with a short walk into the back fields. It was such a lovely day to be out and about. I wasn’t the only one to think so, either. The first blooms of the garden are a trio of purple crocuses, with many more not that far from opening. I can’t recall if I checked the garden yesterday or not, but certainly as of two days ago they were yet to open. 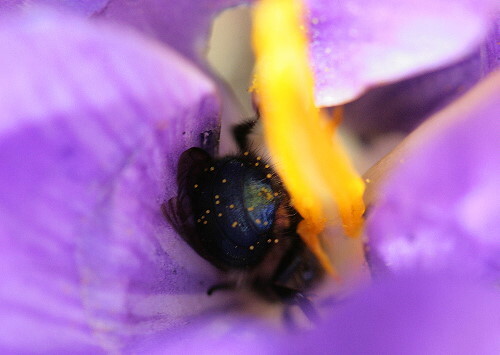 When I went out initially, preparing to rake the garden, I noticed a honeybee checking out one of the blooms. I hadn’t brought my camera, but resolved to come back with it once I was done the section I wanted to work on. 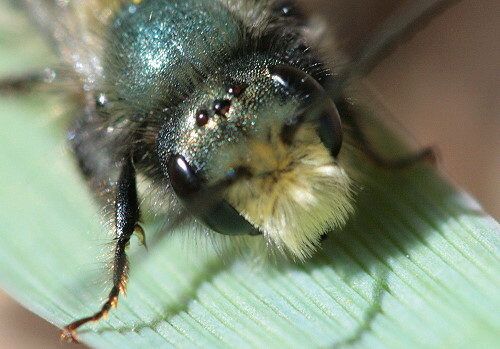 When I returned, the honeybee was long gone but had been replaced by a fuzzy green bee with long antennae. I had a pretty good idea what it was even while looking at it, but confirmed the ID when I came inside. 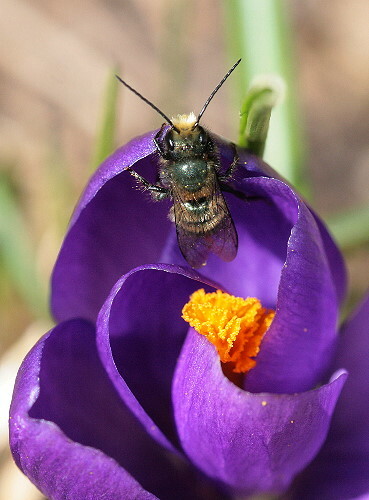 This is a Blue Orchard Bee, Osmia lignaria, a species of mason bee, native bees that fly in early to mid-spring. 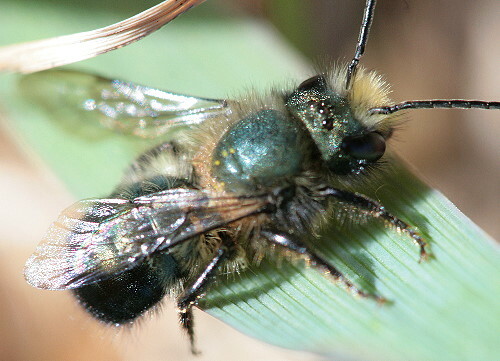 Mason bees are exceptionally efficient pollinators. I’ve seen the statistic that they are 75% more effective than traditional honeybees, and while a honeybee may visit up to 700 blooms in a day and only pollinate 30 or so, a mason bee can visit as many as 1600 blooms and pollinate nearly all of them. I don’t know if those numbers are actually true, but the point they’re trying to make is, in any case. Mason bees are especially good with fruit trees, as their period of peak activity coincides with the bloom of apple and other spring-blossoming trees. Blue Orchard Bees and other Osmia species are especially favoured for this task. This is probably the reason they have the name “orchard bee”. So useful are they to have on an orchard or farm, it is actually possible to buy dormant bees online in the winter for placing outside your home to emerge come spring. Even if you don’t want to bother ordering any, you can still attract them to your yard by using the bee equivalent of a nestbox. Mason bees nest in long, thin cracks or holes, in wood or other substrates – but always existing holes, they don’t excavate their own. Jason of Xenogere in fact mentioned just yesterday that he’d seen some checking out an old mud dauber nest on the exterior of his house (and so I thought it a funny coincidence that I find my own bees when I went out today). Many websites sell mason bee houses (more than sell the bees themselves). Alternatively, you can make your own bee house by taking a block of wood and drilling holes 5/16″ in diameter to a max depth of 6 inches (15cm); put a roof on it if you’d like, and secure it in a south-facing location. Make sure you don’t move it until the bees go dormant in late fall. You can also use small tubes of a similar diameter, preferably ones with textured interiors (such as cardboard, rather than plastic drinking straws) as this provides grip for the bee to apply the material that seals off each chamber. The seals are primarily composed of mud, so it’s helpful to provide a small mudhole or wet soil for them, too. If you use paper tubes, make sure you wrap them in something weatherproof, which also helps prevent parasitic wasps from laying eggs on your developing bees inside. This one was identified as a male for me by one of the hard-working volunteers over at BugGuide.net. He listed a few features that made it a male, but the two most obvious ones to pick out were the relatively small mandibles (I suppose knowing how big they are on females helps with this assessment) and the profusion of long, dense, yellow facial hair. Females have bigger mandibles (they’re doing all the grunt work in building the walls in each house chamber) and much less facial hair. Males emerge before the females do and hang around waiting for them for a few days or a week or two (depending on how warm it is). The first thing the females do when they emerge is mate, and then they spend the rest of the spring building and provisioning homes for their eggs. This species was originally native to western North America, but I guess has been introduced to the east because of its efficiency as a pollinator. 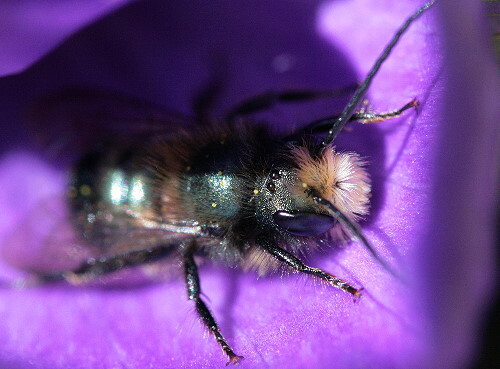 There are lots of websites out there with information about mason bees. You can either do your own Google search, or check out this link, which has lots of good information about their life cycle and how to be a good landlord. I really like your photos in this post, especially the top one and the next-to-last one. Excellent photos! I’ve seen honey bees off and on (on warm days) for several weeks. They were in our compost since no blooms were available. Our carpenter bees became very noticeably active on Tuesday. And today I found what is evidently a mason bee, though I haven’t gotten an ID yet. Same basic shape and same metallic green color, but short antennae. It’s becoming a very bee-z season. Ooo, something else to covet later on, after my berry-shrub dreams become reality. Okay – I HAVE to know – how do you get such amazing close-ups of insects?!? What camera do you use? Lenses? I am insanely jealous of your photo of the bee’s face! Gorgeous shots, Seabrooke! Wow. And I’m tickled with the timing of your encounter. It’s definitely their season. We’ve had honeybees and occasional wasps throughout winter (any day that was warm enough), but now we have a laundry list of them flying around. I should mention I’ve since decided not to knock down the old mud dauber nests at the end of their season (which I’ve historically done to keep them from piling up). The mason bees appear to have occupied ALL of the old nests on the patio–which is pretty doggone cool. So I’ll leave them up for their use. Meanwhile, I just need to get some photos and an ID (they’re beautiful, dark blue, short antennae, and very much in a hurry). Awesome shots! Thank you so much for all this information. I’ve been watching “my” bees in the nesting box I bought. I noticed the yellow nose fluff (for lack of a better description). I still can’t tell males from females — except that it’s been several weeks since they’ve become active. I see a lot of them come out right to the open edge of their tubes and sun themselves (it seems). Their heads are distinctly square and have that white/yellow puff. Your photos are better than my naked eyes! I am in the Limousin, France and have recently seen two medium sized bees together resting in the garden. They had very thick strong looking antenna and a distinctive round yellow nose, almost cartoonish. Sadly I didn’t get a photo of them but they were resting in one spot for the best part of a day and I wondered if they had been blown in from somewhere. I know there are many varieties of bee but do they sound familiar to anyone.